Alexis Barr finished her PhD at the CRUK Cambridge Institute in 2010 and has since been working as a postdoc at the Institute of Cancer Research, London. Her children were born in 2014 and 2016. Both times, Alexis and her husband each took six months consecutive parental leave. 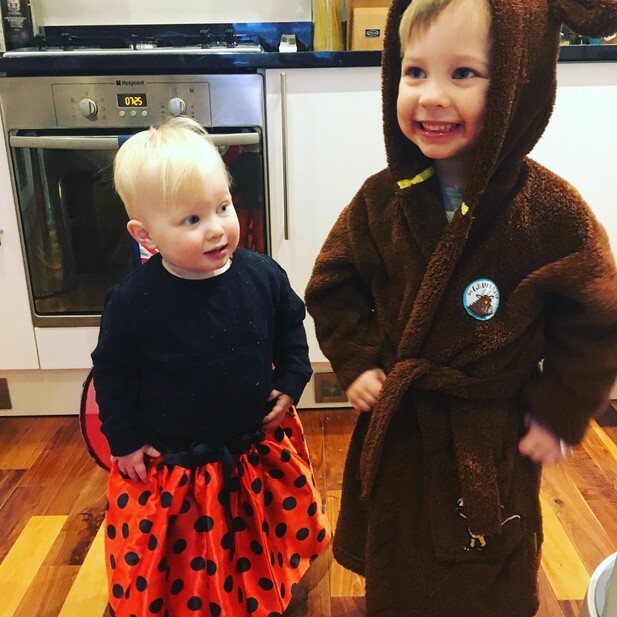 Tor (left) and Otto (right) dressed up for World Book Day. Image credit: Alexis Barr. I have been a postdoc at the Institute of Cancer Research (ICR), London for eight years and am currently trying to find an independent position as a team leader. I have two boys, aged one and three. I met my husband when I was a Masters student at the University of Cambridge in 2005. After a gap year following my Masters, I returned to Cambridge to do a PhD at the CRUK Cambridge Institute, between 2006 and 2010. In 2010, I moved to London to start my postdoc with Dr Chris Bakal in the Division of Cancer Biology at ICR. In April 2011, my husband and I got married. We knew that we wanted to have children but decided to wait until our careers felt a little more secure and we had had the chance to enjoy London’s social scene! Luckily, Otto was born healthy – if a little small – and after three weeks in hospital, he came home fighting fit. I took six months maternity leave, during which I submitted a manuscript on a second project that was accepted while I was on leave. I found maternity leave pretty boring, so I actually enjoyed doing some work while I was away from the lab. After six months, I returned to the lab full time and my husband took six months leave. Back at work, I finished off experiments for the paper I had planned to submit before having a baby. It was finally published in January 2016. By then, we were already writing up another manuscript and so I decided it might be a good time to have another baby. Our second son, Tor, was born in September 2016. We submitted a paper shortly before I went on my six months maternity leave. Fortunately, the reviewers didn’t request any data we didn’t already have, so that I was able to address the revisions whilst I was on maternity leave. The paper was published in March 2017. Again, when I returned to work, my husband took six months parental leave. We were very fortunate to be in a position, both financially and careerwise, to be able to take six months parental leave each. Returning to the lab can be quite daunting after time away and leaving your newborn behind only makes it harder. However, knowing my sons were with their dad made returning to work very straightforward. My team leader, Chris Bakal, was very supportive throughout my pregnancies and periods of leave, and never questioned my commitment to my work and career (as I have frequently heard other team leaders do). In the UK, parents are entitled to up to one year of parental leave, which can be split between two parents. With both my children, I received full pay from the ICR for the first three months of leave, and then switched to statutory parental leave pay for the next three months. When my husband took parental leave with our first son, it was before fathers were entitled to any statutory pay. But, with the second one, he received statutory parental leave pay for the full six months. Our two boys are in full-time, private nursery care, which is excellent, but very expensive. As our eldest is three years old, he is now eligible for 30 hours of free childcare per week (from the government) which helps enormously, especially with two children in full-time care. Unfortunately, our families do not live very close by, and my parents are still working, so they are not able to help out in emergencies. Our families are nevertheless very supportive, and if my husband and I need to travel for work, they can come and help with the children. The ICR are very supportive of parents and have adopted measures to make working lives and careers fit in with raising children. For example, at the ICR you can be a postdoc for seven years max. However, they operate a ‘stop the clock’ policy, in which periods of leave can be added on to this seven-year limit. In addition, meetings and seminars are, for the most part, held between the core hours of 9:30am to 4pm, so that people with caring responsibilities are not excluded from taking part. They also offer small amounts of funding to cover childcare costs when employees are taking part in training activities. To be honest, I haven’t found it nearly as difficult as I thought I would. In fact, if anything, I am much more relaxed about work and my career than I was before having children. For example, I used to frequently work evenings and weekends prior to having children and used to find it hard to switch off. But now as soon as I pick up the children from nursery I forget about work and focus on them. And by the time they are in bed, we’ve had dinner and done some chores it’s pretty much bedtime for me too. I have adjusted my working hours after having children to work from 7am to 4pm. My husband drops them at nursery and I pick them up. The key is to plan your working day well so that you can fit in as much as possible. It also helps that I have a very supportive husband and that our childcare is split 50:50 between us. I think the high costs of childcare pose a big problem. Almost my entire salary goes into nursery costs and, for many, this is just not tenable. If research institutes and universities could provide access to affordable childcare then I think this would persuade most parents that returning to work is worthwhile. Another problem is the lack of scientists working part-time, particularly in more senior positions. Many of my parent friends work part-time, yet I only know of two scientist friends who do so – and they operate a job-share at a Scientific Officer level. Many scientists are extremely lucky in that they can work flexibly and fit their work around their parenting commitments but this isn’t the same as part-time. It just means making up any missed hours during evenings and weekends. Despite almost all funding bodies asking the question “Do you want to take this award on a part-time basis?”, I do not know any grant holders who work part-time. Many arguments have been made about the feasibility of carrying out research projects on a part-time basis and perhaps this is why people don’t do it. But I think it is something that could be looked into more carefully. Do it! It’s never as bad as you think (or as many people tell you). I also realised that collaborations are extremely beneficial and make a huge difference to my working life. Having various people working towards different aspects of a project means that the project is constantly being driven forward, even if your part is slower at times (for example when you’re on parental leave). I think that scientist parents have several advantages compared to other professions. First, most scientists (at least in academic research) can work flexibly and organise their time as they wish. And no-one will bat an eyelid if you say you need to leave at 2pm to go and see your son’s Christmas concert. Second, many scientists work as part of a team. That means if your child is sick and you can’t get to the lab but you would really need to add a drug, process a sample or image cells, there is usually someone in the lab who can do it for you. Finally, I think having a job that you are passionate about sends out a great message to your children, that you’re not just going to work to earn money but also to enjoy yourself, discover new things and hopefully make a difference. Having said this, there are obviously disadvantages, one of them being short-term contracts, especially in junior positions, which provide a lot less stability and can make the process of starting a family seem daunting. It also means that families may have to move location to take up new positions, which may disrupt family life. The lack of part-time opportunities is a disadvantage. Many of my non-scientist friends (particularly mothers) do work part-time, which does not appear to have affected their career progression (so far).